We want to compute the Doppler effect of a satellite with respect to a ground station. On the one hand, we define the Local Orbital Frame (LOF) related to the satellite. an orbit defined by the position and the velocity of the satellite in the inertial frame at the date. The initial orbit is just set as a CartesianOrbit. 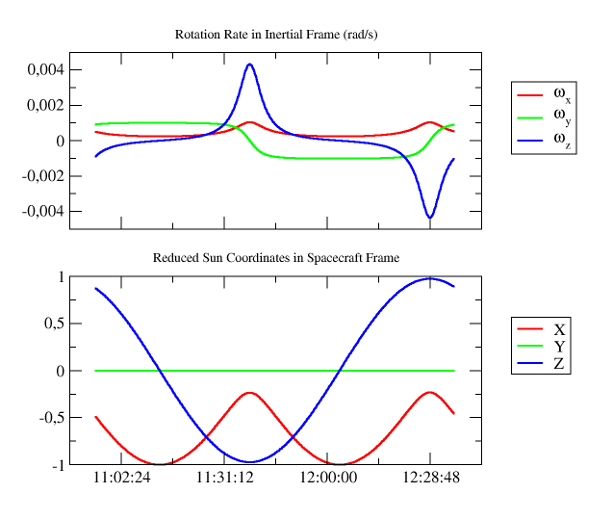 More details on the orbit representation can be found in the orbits section of the library architecture documentation. As a propagator, we consider a simple KeplerianPropagator that will propagate orbit in the inertial frame in which the initial orbit was defined (here EME2000). On the other hand, let’s define the ground station by its coordinates as a GeodeticPoint in its own TopocentricFrame related to a BodyShape in some terrestrial frame. More details on BodyShape and GeodeticPoint can be found in the bodies section of the library architecture documentation. More details on TopocentricFrame can be found in the frames section of the library architecture documentation. The complete code for this example can be found in the source tree of the library, in file src/tutorials/fr/cs/examples/frames/Frames1.java. The problem is related to the one exposed in the User defined frames subsection of the frames section of the library architecture documentation. It can be summarized by the following schema. 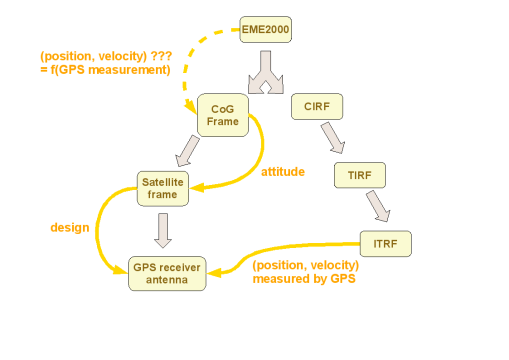 For a given satellite, GPS measurements for position and velocity, expressed in the ITRF frame, are available at any moment. The GPS antenna is fixed with some offset with respect to the satellite reference frame. The attitude of the satellite reference frame with respect to some moving frame related to the satellite center of gravity (CoG) is known at any moment. We want to compute for some instant the position and velocity of the CoG in the EME2000 inertial frame. A possible solution provided by OREKIT is detailed above. The CoG frame has its origin at the satellite center of gravity and is aligned with EME2000. It is linked to its parent EME2000 frame by an a priori unknown transform which depends on the current position and velocity. This transform is what we want to compute. So we can now update the transform from EME2000 to CoG frame. The updateTransform method automatically locates the frames in the global tree, combines all transforms and updates the single transform between CoG itself and its parent EME2000 frame. The complete code for this example can be found in the source tree of the library, in file src/tutorials/fr/cs/examples/frames/Frames2.java. Let’s consider a spacecraft which attitude is guided by a yaw steering law, we want to plot some of the effects of such a law on the spacecraft motion. More details on the attitude representation can be found in the attitudes section of the library architecture documentation. As a propagator, we consider an analytic EcksteinHechlerPropagator. More details on Propagator can be found in the propagation section of the library architecture documentation. The complete code for this example can be found in the source tree of the library, in file src/tutorials/fr/cs/examples/frames/Frames3.java.